Source: Karl Rove on why Romney lost: Obama was ‘suppressing the vote’ – CSMonitor.com. “He succeeded by suppressing the vote, by saying to people, ‘you may not like who I am, and I know you can’t bring yourself to vote for me, but I’m going to paint this other guy as simply a rich guy who only cares about himself,’ ” Rove said. By his definition of suppression, it sounds just like traditional “opposition research” and negative advertising. Does Rove (himself a purveyor of negative ads in his work for George W. Bush and now at the Crossroads GPS group) have some different point to make, or is this just sour grapes over the election outcome? 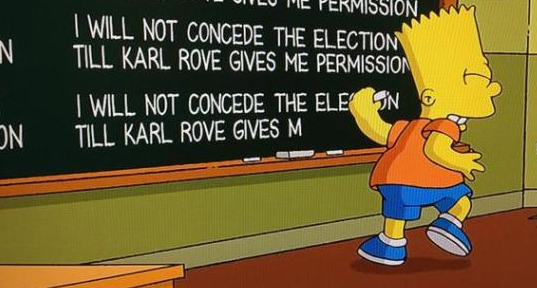 Karl Rove has a lot of explaining to do. He took over a $1 billions from some very rich folks and delivered virtually nothing for them. Not only did their candidate Mr. Romney lose the election but many of the tea party also came up short. Mr. Rove has a lot of explaining to do but even I did not imagine he would blame it on President Obama suppressing the vote? Before the elections we heard news that Republican governors in Ohio, Pennsylvania, and Florida were doing things to make it harder for people to vote. They were instituting last minute voter ID laws and such; thank heavens our judicial system cancelled most of them before they were implemented. They were shutting down early voting because it looks like minorities were the predominate participator in that process. They made some, mostly in Democratic districts, stand in line for over seven hours when they tried to vote early. So, to hear Mr. Rove explain why he wasted so much of his donor’s money is a total surprise to me. He wants to blame it on the very thing that he so successfully instituted for George W. Bush. He practically invented the modern day version of mud slinging. I just couldn’t help but laugh out loud (that’s “LOL” to you young folks) when I saw the above title. I laughed even louder than when I heard of his childish rants about not conceding on election night. Mr . Rove has done a great disservice to the GOP with much of his meanness over the years. He is sixty-two this year so maybe it is time for him to retire. I’m sure he siphoned all a pretty big chunk of that $1 billion in personal fees so he shouldn’t have to worry about money. But of course for people like him it is all about power so I doubt that he will leave the playing field voluntarily. I wonder if any of the GOP hopefuls coming up will go to him for any advice? We would all probably be better off if they didn’t. Maybe the next generation of GOP leaders will be more tolerant of differing views. But I am just a simple guy so what do I know…. Like Rumsfeld—I cannot wait until this man just disappears. Together with Chenney- they destroyed the modern Army by putting us in a war we did not belong in and then privatizing the military with impossible to get rid of contracts. The military’s housing is now OWNED by a private company for the next 99 years. The got rid of mess hall privates and tried to get people to serve in the war—paying them huge bucks- it got old- so our troops eat MRE’s. These men are evil in my eyes. Heck- THEY are making more money then anyone can stand. They can take Sarah- I don’t know where anything is except my hockey lipstick- with them. Jannette thanks for your additional military information. Yeah I have heard that the “all volunteer” army is not what many people think it is. If I was a “grunt” that signed up for the army and had to work next to one of those guys who are being paid much more than me I would be upset. It is nice to see that you also agree that some of the past big shots need to disappear. At least we agree on that….